New Donk City Hall in Super Smash Bros. Ultimate. Main: Jump Up, Super Star! Alternate: Ground Theme (Band Performance) - Super Mario Bros.
New Donk City Hall (ニュードンク市庁舎, New Donk City Hall) is a playable stage that appears in Super Smash Bros. Ultimate. It takes place around New Donk City, part of the Metro Kingdom from Super Mario Odyssey. Dr. Mario is fought here for his unlocking battle. 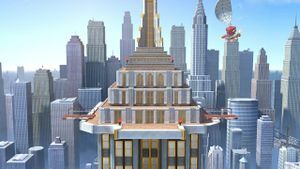 In this stage, a platform progressively carries the fighters up New Donk City Hall, stopping at various points along the way up before getting to the very top. The stage platform will then carry the fighters back down to the ground level for the cycle to repeat. A unique feature to the stage is its dynamic background music: The Super Mario Players and Pauline will float by in the background, and if a fighter touches a band member, they will add an instrument to the music. This only occurs if the music is set to "Jump Up, Super Star!" or "Ground Theme (Band Performance) - Super Mario Bros." The Odyssey, Mario's airship that he uses to venture to the different kingdoms in Super Mario Odyssey, flies in the background of this stage. Captain Toad is also in the background on top of the city hall, and he appears more consistently when music from his game is playing. When hazards are turned off, all moving platforms, except the transformation platform, do not move. Pauline and the Super Mario Players are also absent, which means the music will not dynamically change, even if set to the songs listed above. The Ω form and Battlefield form are suspended in the air and their main platform is reminiscent of New Donk City Hall, such as the floor resembling the building's roof tops and the walls resembling the bulding's facade. The stage is also the same size and shape as Final Destination and Battlefield, respectively. New Donk City Hall and the surrounding area is absent. The three soft platforms of the Battlefield form resemble the floating soft platforms that appear in certain stops of the regular form. 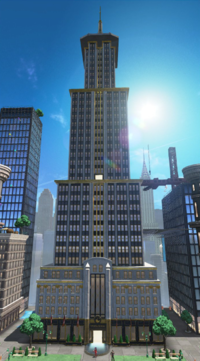 New Donk City Hall as it originally appeared in Super Mario Odyssey. This stage is based around the city hall of New Donk City of the Metro Kingdom, which is the eighth kingdom Mario and Cappy visit in Super Mario Odyssey. The duo starts off in a rainy New Donk City as a Mechawiggler, reigning over the city hall, is in control of the city's electricity. Mayor Pauline, upon seeing her old friend visiting, asks Mario to take care of the creature. After Mario defeats the Mechawiggler, she invites him to New Donk City's upcoming festival to show her gratitude; however, she needs four backup musicians to perform in its musical number and tasks Mario with recruiting them. Mario recruits a drummer, a guitarist, a bassist, and a trumpeter to form The Super Mario Players with Pauline as the singer. After Mario restores power to New Donk City, the festivities begin with The Super Mario Players performing "Jump Up, Super Star!" on a stage built on New Donk City Hall. Captain Toad where he originally appears in the Metro Kingdom. Captain Toad makes several cameos within Super Mario Odyssey, including on a long girder located behind New Donk City Hall. Interacting with him gives Mario a Power Moon. Full view of the bottom of the stage. The bottom of the stage, with The Super Mario Players and Pauline. The middle part of the stage. Higher part of the stage, with the Odyssey and Captain Toad. The Super Mario Players and Pauline. Daisy on the stage with Pit and Mega Man in Stamina Mode. Chef Kawasaki using his cooking attack on the stage. The New Donk City Festival in Super Mario Odyssey with Mario, Cappy, The Super Mario Players and Pauline. The Odyssey can be seen flying in the background with 21 Power Moons powering it, which is how many Power Moons it has in its official artwork. In Super Mario Odyssey, however, at least 55 Power Moons are required to visit the Metro Kingdom. This page was last edited on April 16, 2019, at 01:34.